We've got to give Nokia credit: they managed, against all odds, to come up with a truly unique form factor in creating the Twist for Verizon -- a combination of shape, design, and mechanism that had never quite been seen before. 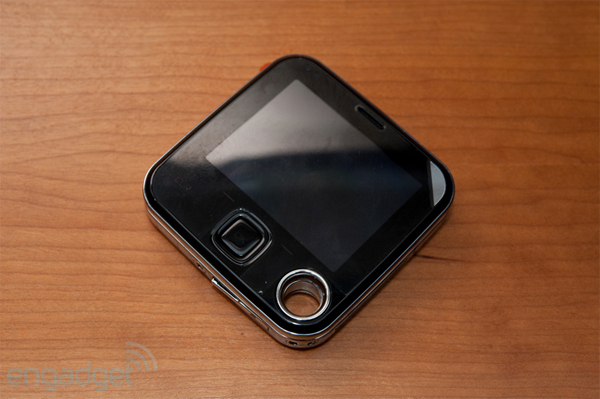 Thing is, it's the year 2009 and virtually every legitimate form factor has been explored, so how'd they pull that off? In a word, the Twist is... well, weird. A perfect square that swivels 90 degrees on a chrome ring with multicolored lights isn't the most obvious way to put a phone together, but the old adage of "different strokes for different folks" definitely applies here. Follow the break to find out why. Closed, the Twist doesn't even remotely resemble a phone -- a PMP, perhaps; some sort of Japanese electronic pet game, maybe; but certainly not a phone, much less a Verizon-branded one. You won't be making calls in this mode -- and anyone with larger hands might have a hard time fumbling with the navigation controls below the screen without dropping the microscopic phone itself -- but at least it takes up a bare minimum of pocket space without the cheap look of, say, the Blitz. The Blitz is a much less expensive phone, true, but from the average customer's perspective once they're in the store, these two might end up getting cross-shopped since they both feature QWERTY keyboards and look roughly the same both in the closed and open positions. 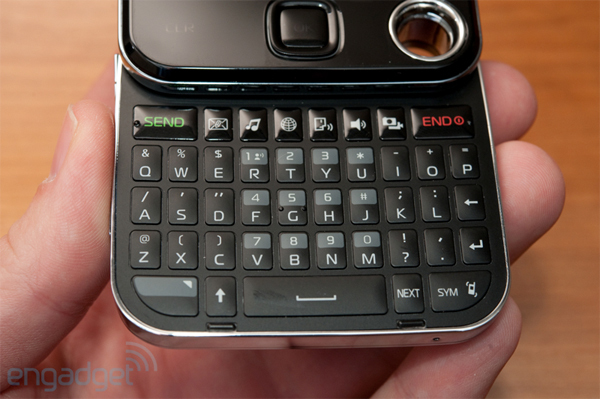 With a flick on the top half of the phone, the spring-loaded chrome ring (with configurable alert lighting, no less) takes over and swings 90 degrees to leave you with a full keyboard (and maybe more importantly, something that you wouldn't mind holding to your face to make a call). When open, you get pretty much the same infamous experience you expect from any Verizon featurephone. It's not bad, per se, it's just very red, just a touch laggy, and not nearly as slick as the software Nokia offers on its featurephones globally. We understand that from Verizon's perspective it's all about standardization in the name of better customer support, but plenty of carriers around the world manage to pull it off -- so Verizon, with its vast resources, shouldn't have a problem diversifying a bit. Anyone coming from the Intrigue will feel especially at home, thanks to the inclusion of that unusual, vaguely social Habitat Mode that calls up recent contacts onto the home screen. Where the Twist really shines (by design, we suspect) is messaging. The keyboard is really quite good, with plenty of feel and key separation; we had absolutely no trouble navigating it with our fat fingers. If we had one complaint here, it's that the numeric keys don't have enough visual pop -- and they're backlit in exactly the same color as the letters -- so it's pretty hard to quickly dial without concentrating on the keyboard and watching what you're doing. We think this could've easily been solved by making the gray bars on the number keys, say, red or green and backlighting them in the same color. The integrated browser stinks, but we weren't expecting much, and we don't expect potential Twist customers are buying this phone to browse full HTML websites. 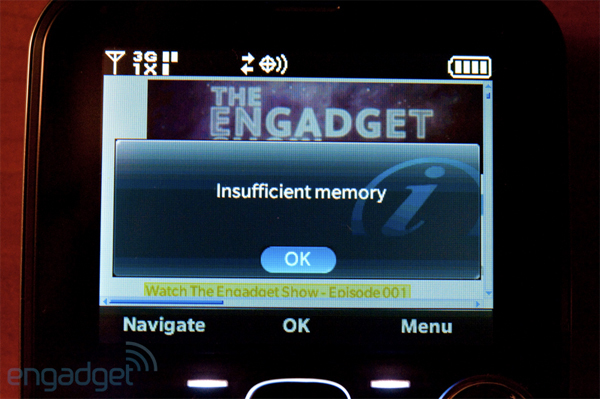 Engadget, for example, pops up this memory error, though we were able to navigate past it and load most of the important stuff on the page. It works in a pinch, but it's not pretty, fast, or easy to use. Some might say, "I don't want a phone that looks good, I want a phone that works well." There's no question that the Twist is a compromise -- no one, not even Verizon or Nokia, would dare make the argument that this is the ultimate form factor for productivity. That's not why the Twist exists. It's a sharp-looking phone that's just strange enough to turn heads, has a great keyboard for messaging, and accomplishes everything else your average midrange phone is expected to do acceptably well. (Heck, drop Series 40 on this, swap radios, and sell it internationally as a new budget style phone -- Nokia's certainly no stranger to hawking odd form factors in the name of fashion.) And hey, if you want the same thing with a more traditional design, just head on over to the similarly-priced Intrigue -- but for some, the Twist is just what the doctor ordered.